The Discs of Silence the world’s second best passive isolator? The Discs of Silence is our workhorse isolator as in its Heavy- Duty version can effectively isolate up to 175kg (385lbs) per set of four discs. When we developed the Discs of Silence was our goal to create the most efficient and load capable isolator as possible without taking too much height in claims. It would also be height -adjustable and be adaptable to uneven loads. Enter the Discs of Silence! 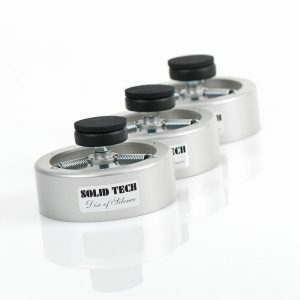 The Discs of Silence isolation-system consists of a cylindrically formed, sturdy and anodised Aluminum base, extension-springs, center-hub and a height-adjustable center-screw with a damping layer for mechanical coupling to the component. The Discs of Silence are available in 3 or 4pack. The equally simple as ingenious horizontal location of the extension-springs allows a large capacity without taking as much height in claims. When correctly loaded the operating height is 32-35mm. Correctly adapted and loaded is the resonance frequency well below 4Hz. Ensuring isolation even in the lowest and most degrading frequencies, resulting in much higher fidelity without tonal highlighting and masking such as more dynamic, cleaner transient response, wider and deeper soundstage, increased low level information, tighter bass and silkier highs. Optimized adaptation to a specific weight of each disc is obtained by adding the right number of springs, as well as the height adjustment of the center-screw. Each disc can be configured with two, three, four or six springs depending of the amount of load. In the case of supply are three springs mounted and included and then the system can be loaded with max 45 kg when the center screw is adjusted to its top position. 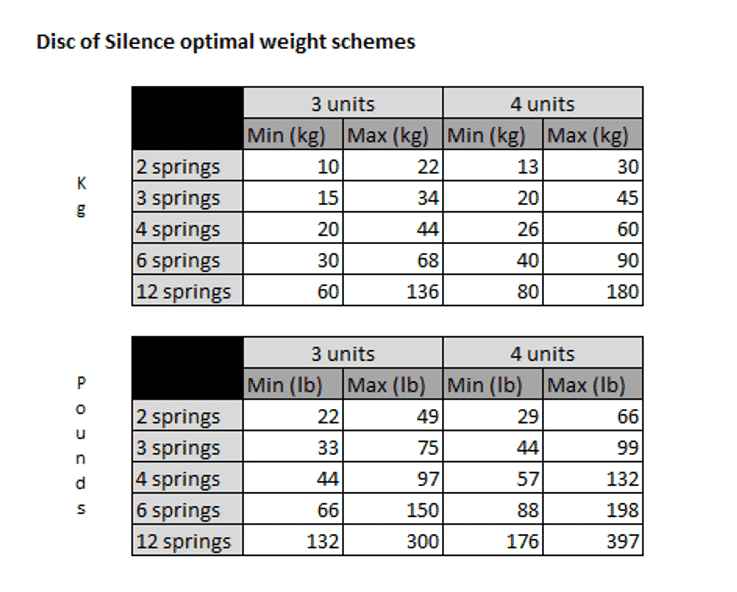 Additional spring-set can be obtained and then doubled the capacity to 90 kg per set of four discs. In the case of supply of the HD version are twelve springs per disc included but only six mounted. See below for configuration. Pure technology – No voodoo. The proof is below, 88,48% reduction at 20Hz. Have you ever seen an independently conducted vibration measurement from any other audio-isolator manufacturer?